Two University of Plymouth academics have edited a new book outlining developments in the marine renewable energy sector and some of the future challenges it faces. Professor of Ocean Engineering Deborah Greaves and Professor of Coastal Engineering Gregorio Iglesias are both renowned experts in the field, having led a number of major national and international research projects. 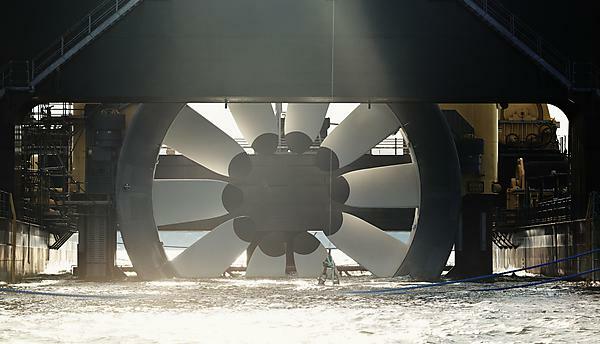 Their new book, Wave and Tidal Energy, aims to provide a comprehensive review of the continually-developing sector, drawing from the latest research and experience of device testing. It includes detail on key issues such as resource characterisation, wave and tidal technology, power systems, numerical and physical modelling, environmental impact and policy, as well as an up-to-date review of developments worldwide and case studies of selected projects. Set for release in June and published by Wiley, it acts as an overview of wave and tidal energy suitable for newcomers to the field, and a reference text for students and practitioners in the wave and tidal energy industry. Professor Greaves is Head of the School of Engineering and played an integral role in developing the COAST (Coastal, Ocean and Sediment Transport) Laboratory within the Marine Building. She has led many national and international research projects concerning offshore renewable energy (ORE) in collaboration with industrial and academic partners, in 2017 was appointed by EPSRC as the new ORE Supergen Leader and has published over 150 peer-reviewed papers. Professor Iglesias is Leader of the COAST (Coastal, Ocean and Sediment Transport) Research Group, and he has over 20 years' experience in numerical and physical modelling applied to marine renewable energy and coastal engineering. He is a member of the IEC Technical Committee for sub-prototype size wave energy device development and one of the inventors of the WaveCat, a Wave Energy Converter. Professor Iglesias has published over 150 peer-reviewed papers and secured over £12 million research funding. The COAST Engineering Research Group is a leading team of coastal and ocean engineering researchers carrying out both fundamental and applied research. The group contains recognised specialists in laboratorymodelling, numerical modelling, field experimentation and theoretical analysis.